Did You Know: Roughly 2,000 kids get lost or go missing every day. But with the iGPS Watch, you can worry less about ever having to experience that heart pounding, gut wrenching feeling of wondering where your kid is. The iGPS Watch is the Closest thing To Holding Your Child's Hand All Day! You want to be with your child every step of the way, every moment of their day. We get it we're parents too! We have the same concerns, worries, and fears you do. The iGPS Watch loaded with alert and safety features that let you relax and get on with your day. The iGPS Watch really is like holding your child's hand all day long! Talk To Your Kid Just Like A Phone! Feel confident knowing your kids can call you with a simple press of a button and you can call their watch just like a phone! 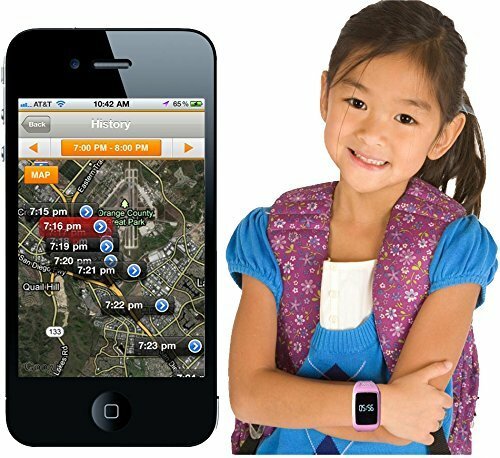 The ONLY kids watch with Live GPS Tracking lets you instantly see where they are on your smartphone or computer! Get an immediate text message the instant your kid's watch is removed. Our patented Removal Sensor can't be found on any other kids watch! If your child steps out a safe-zone that you create - like school, park, friend's home, etc. - you'll get an instant text message alerting you that they've stepped 'out of bounds'. Kids can trigger an emergency phone call by simply pressing the SOS button. The iGPS Watch automatically calls up to 8 preset phone numbers until it reaches one of your contacts. Want to 'Check In' and make sure your kid's ok? Now you can by calling their watch in Listener mode, so you can listen to your child's surroundings. Yep, they're having fun in class. Watch activation required. Monthly or Annual Service Plan available. Send text to the iGPS Watch Phone, Replies Back with Longitude and Latitude Coordinates on Google Maps. Parents/guardians can set Geo-fence boundaries around their home, school, or at the park. Parent will get an instant SMS notification to their cell phones as soon as their child steps out of the set way-points with the iGPS Watch Phone.